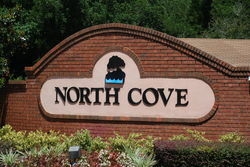 North Cove is located off EE Williamson Road between Markham Woods Road and Lake Emma on the north side of Longwood Florida bordering Lake Mary. This community was developed in the late 70s and early 80s and consists of custom and semi-custom homes. There are many large old oak trees throughout the community and many homes back up to conservation areas. Shopping and restaurants are nearby on SR 434 to the south and Lake Mary Boulevard to the north. I-4 can be accessed from either the east or west using SR434 or at Lake Mary Boulevard.